As one of the more recently emerged avian flu viruses (spring 2014), and with the bulk of its activity occurring in China, there's a good deal about the HPAI H5N6 virus that we don't know. A quick search of PubMed returns only a disappointing handful of abstracts for H5N6, compared to more than 7,000 for the H7N9 virus. In the 20 months since it was first detected, we've seen 9 human infections (5 in the past month), with most having a fatal outcome. We've seen numerous poultry farms (ducks, geese & chickens) affected in China, Vietnam and Laos, and the virus has been isolated in live bird markets (LMBs) in China. We've also seen scattered reports of wild birds (egrets, falcons, magpie robins) found dead in Hong Kong with the virus, and last summer, in H5N6 Rising: Infecting Birds, Humans, & Even Cats, we learned cats were susceptible. But our knowledge of its ecology, epidemiology, evolution, and host range remains extremely limited. We don't tend to get a lot of information out of Mainland China, but today the Chinese Ministry of Agriculture reports a farm raising black swans and peacocks located in Hunan Wuling was hit by the H5N6 virus earlier this month. You may recall the OIE reported a different peacock farm in Huaihua, Hunan - nearly 300 km to the southwest - was hit by the same virus in early December, 2015. 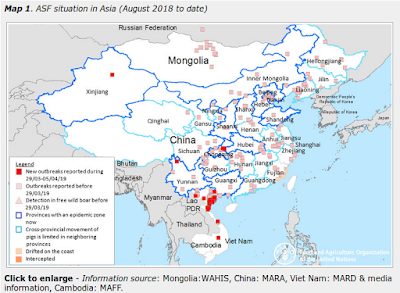 While H5N6 hasn't managed to spread as aggressively as H5N1 and H5N8, the virus continues to gain ground in China, and there are legitimate concerns this virus might expand its geographic range to Europe, Japan, India, or even North America over time. Agriculture Ministry press office on January 18 release, Changde City, Hunan Wuling occurred rare breed of highly pathogenic avian influenza. January 9, Changde City, Hunan Wuling a rare birds breeding farm reared black swans, peacocks and other suspected bird flu symptoms appear, the incidence of 165, died 91. January 12, animal disease prevention and control center in Hunan diagnosed as suspected bird flu. January 18, by the National Avian Influenza Reference Laboratory confirmed that outbreaks of H5N6 subtype highly pathogenic bird flu. After the outbreak, the local plan and control techniques in accordance with relevant regulatory requirements, earnestly epidemic disposal work. 1132 has been for the rare birds and poultry culling and safe disposal. Currently, the outbreaks had been effectively controlled.